Today, I continue with my series on favourite Book Chook platforms for creative literacy, with three online places I love to create comics. I was introduced to Toon Doo at What Ed Said where Edna often uses Toon Doo comics to illustrate her blog posts. I love the way she communicates succinctly with them, grabbing my attention to read on. It took me several visits to come to grips with the variety of features Toon Doo actually has. Even though I've been using it for more than a year, I often discover something new I can do there. It's worth joining Toon Doo so you can save your work there. Once you do, head for Tools/Toon Doo Maker and select a layout - one, two or three panels. I have found this takes a while to load for me lately, despite our fast internet. Once the template is loaded, you'll see a screen that has your untitled, empty comic on the right. a horizontal row of tools at the bottom that help you make elements you've dragged smaller, larger, flip or rotate them etc. Truly, the best way to learn is to play around - you can't break anything. Once done, I suggest you save (under Toon Doo "start here" icon) by checking "keep it private" and think about the other things you check. With kids, it might be safest to keep what you make just for you rather than to share. I love the versatility of Toon Doo. There is a ton of art work made available for users, and lots of ways to customise them. 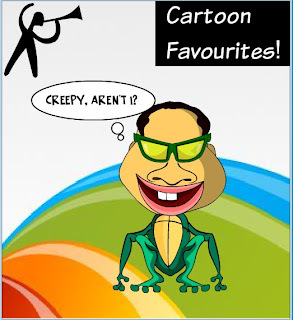 Toon Doo describe themselves as the "World's fastest way to create cartoons" - I think they also have the largest variety of cartoon elements. I've only touched on a few of the features here, and urge you to explore it with your kids when they're old enough. I wrote previously in some detail about making books at Toon Doo, and using Toon Doo Spaces. Although it's not referred to as a comic editor, I think of the Storybook feature at Kerpoof as just that. Reason? 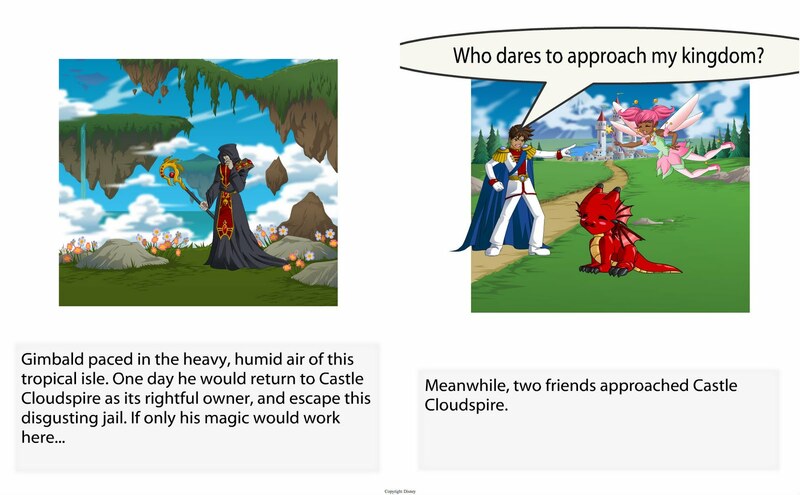 Its characters are quite cartoonish, and it has editable speech bubbles as well as a small section under each created picture for text. I wrote in detail previously about Kerpoof in Write Stories and More at Kerpoof. Creaza has a great suite of tools - a comic editor, movie editor, mindmapper and audio editor. I discovered the comic editor, Cartoonist, back in 2009. I told you about it in detail, and have had a soft spot for it ever since. Cartoonist has lots of thematic universes with their attendant backgrounds, characters and objects. 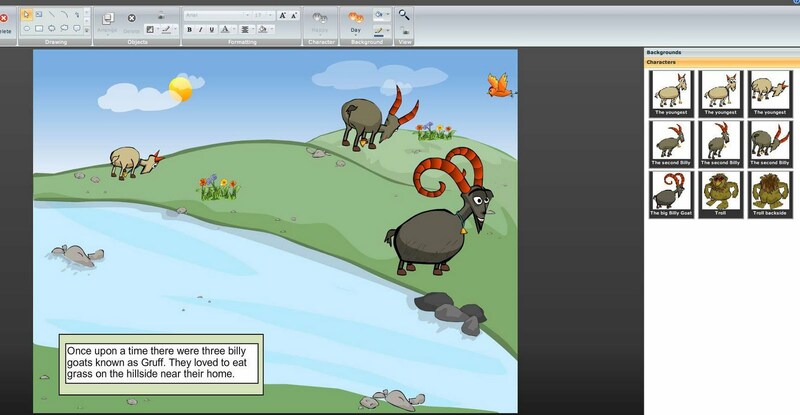 I chose Three Billy Goats Gruff for my illustration today, but there are themes from history and politics too. Creaza has a really helpful tutorial video on the home Cartoonist page to watch and listen to before you start creating your comic. There's quite a bit to learn, but it's worth learning to get the most from your experience. Sometimes we can see screens and screen-based entertainment as the enemy of creating and learning. 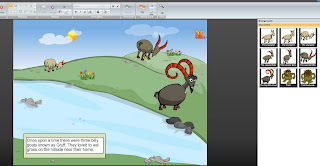 But creating comics at websites like ToonDoo, Creaza and Kerpoof involves children in all sorts of literacy-related thinking and problem-solving. You'll find more ideas for encouraging kids to write under "writing" in the blog's right sidebar. Catch earlier posts in this series with Book Chook Favourites - Book Creation, and Book Chook Favourites - Making Posters.